St. Mary’s Rubbers Pvt Ltd is promoted with these visions and is now on its rails towards better and better heights. The Company realizes the fact that customer relation is the primary necessity for any business and to achieve the same ample efforts and continuous commitments are required. Bearing these in mind, the Company started to implement a planned project. On every stage of its formation, utmost care has been given to achieve its object. Right from the beginning our focus was on good manufacturing practices. This made us easily meet the prescribed standard and specification for processed latex, set by the Bureau of Indian Standard. Moreover, nowadays to enter into international market recognition by the International Standard Organization is inevitable. Company got ISO 9001:2008 and ISO 14001:2004. A full-equipped testing laboratory has been set up at the processing center to ensure testing and analyzing both raw material and finished product. 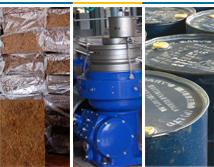 Strict quality assurance of the product is achieved through systematic material testing and analysis. The Company initially started its operation with a single latex separator machine. Through a well planned activities and operations Company achieved prime position in number of latex separators in its most modern plant now, and subsequently gained a considerable production capacity through a phased manner during these years. For achieving value addition in the process, we have started a Skim Crepe Unit in the initial year and quality crepe is exported and sold domestically. Subsequently, in view of further value addition in Crepe Processing, we have commissioned a new plant for converting Skim Crepe to Skim Block, which is generating high demand from both domestic and international markets and we are exporting the same too. Mr. Sunny Jacob, Founder - SMR, hails from an esteemed family at Kanjirappally, Kottayam(Dt. ), Kerala, India. He followed the path of his parents in cultivation of Rubber and other cash crops right from his schooling years. Later he recognized the potential of crop-based industries in Kerala economy. As an enthusiastic entrepreneur, first of all he started a dealership business of Rubber. During this period he studied the scenario of Rubber industry and understood its diversified fields and opportunities. Thus Mr. Sunny Jacob got started M/s. St.Mary’s Rubbers, a Proprietary concern and leased a small Latex processing unit in the district of Trichur. With earnest determination and commitment to his activities, he steadily progressed. After gaining ample experience in practical aspects of business administration and awareness about overall factors associated with the rubber industry, he came down to his native district and started a small latex processing unit of his own. Since he could not settle down as owner of a simple processing unit, he dreamed of setting up a fully fledged company with all infrastructures for processing Centrifuged Latex, marketing the same – both in international as well as domestic markets – and to continuously contribute towards the progress of the industry and thus development of our society.